Oh, my it has been hot up here in the hills! When you wake up at 6 AM in Northwestern PA to temperatures already in the mid 70’s oh and let’s not forget to add in a little humidity that you can literally cut with a knife, then you know you are pretty much guaranteed a hot day ahead. I have learned over the years how to keep the people here cool with my own version of redneck air conditioning but my poor animals needed help now as well. 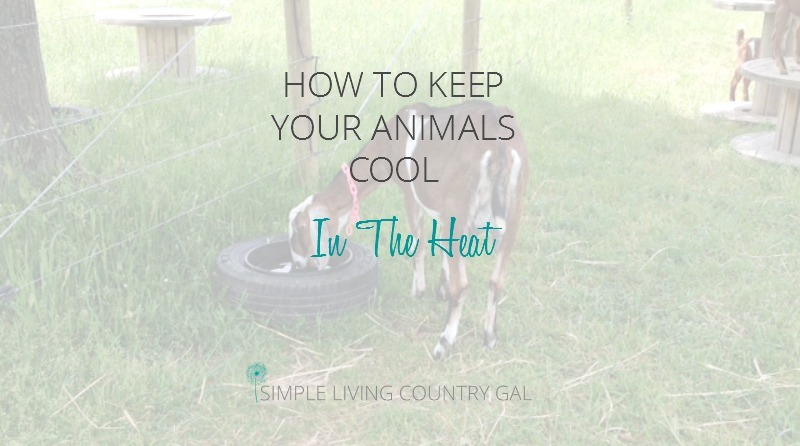 Let’s chat for a minute on keeping animals cool in hot weather. Heat can kill especially in the southern states so it is important to know what you should and should not do with your animals when you want to cool them down. Oh, my poor pig. She is warm on a cool day, so when it’s hot we do our best to keep her cool in the summer heat. Since pigs do not have sweat glands they are unable to sweat and release internal heat. Pigs also have smaller lungs limiting their ability to pant. This makes pigs much more prone to heat stress. This is why pigs love to roll in the mud. Having a nice layer of cool mud really helps to cool them down and also protects them from sunburn. Yes, pigs, especially light colored pigs, can get sunburn and pretty quickly too. 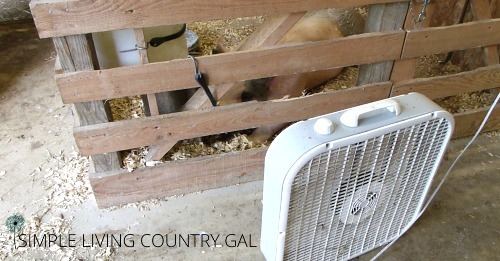 Since we prefer to keep our pigs inside of the barn we like to run a fan on them at all times. This really helps them to cope better with the hot. We also keep our pigs in the coolest section of the barn that gets the least amount of sun. Access to fresh water and a cleaned water system is essential for her and encourages plenty of drinking. If you notice your animals are not drinking as much water as they should, you may want to clean out their water dish or water system. To make sure she is eating enough we prefer to feed more often and in small amounts. 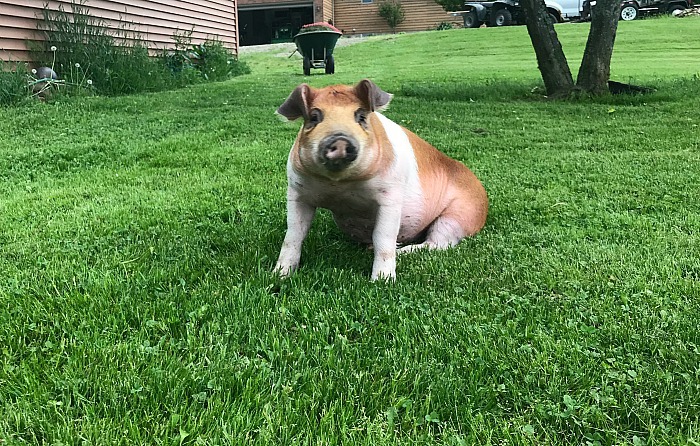 Too much food on a super hot day is not something even a pig enjoys so by giving smaller portions of her feed more often she will continue to gain weight all summer long. Each evening we like to take our pigs out for nice long walks in the cool grass. We will even include a little play time in the water with a spray down from the hose. Caution: If you hose your pigs down during the day always start at the rump and move your way up to their heads. Sudden cold water on a hot pig’s head can cause shock or even death so please be extra careful. Finally, cool treats like watermelon ends, frozen fruits and veggies are not only yummy but will help to cool them down as well. Like pigs, chickens also cannot sweat. Panting or fanning out their feathers helps to release some of that heat. 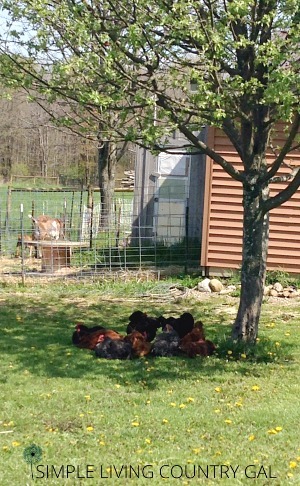 It is important to make sure your hens have a shady area available. If you don’t have a tree over your run, then a tarp can work just as well. As with all animals, water is the key to keeping cool. 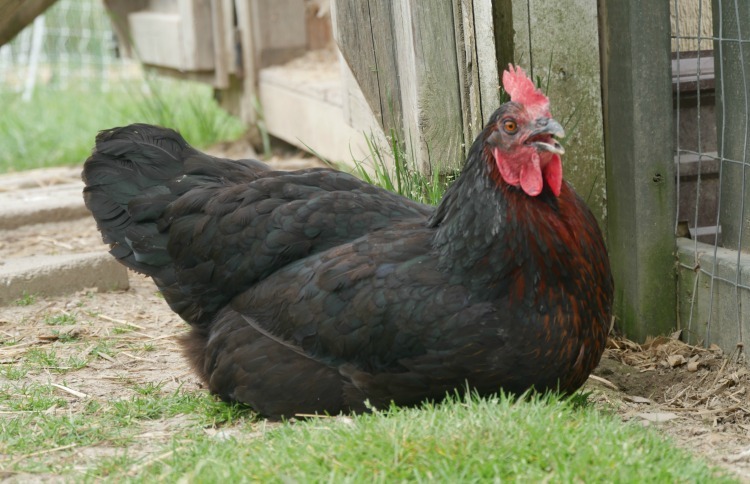 For my chickens, I like to have more than one source of water. There is water inside of the coop, one inside of their run and outside under a shade tree if they are free ranging that day. 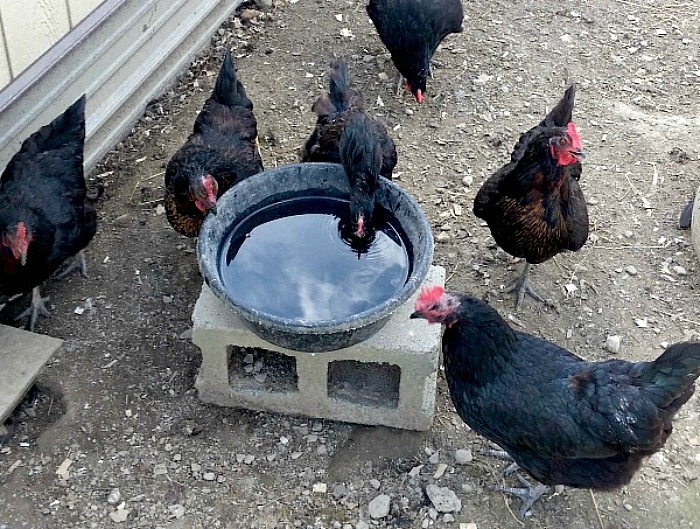 Chickens forget to drink especially if the water is out of sight so by having more than one option they will drink more keeping cooler. A great treat for the gals is frozen fruit and veggies especially in the afternoon when things are really cooking. This is an excellent way to get rid of those watermelon rinds. 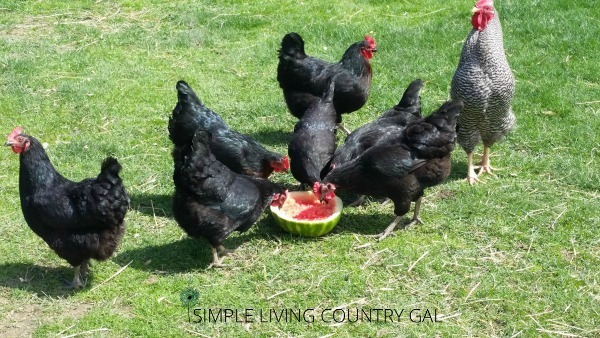 Your chickens will peck away at them until all you have left is a paper thin piece of watermelon skin. 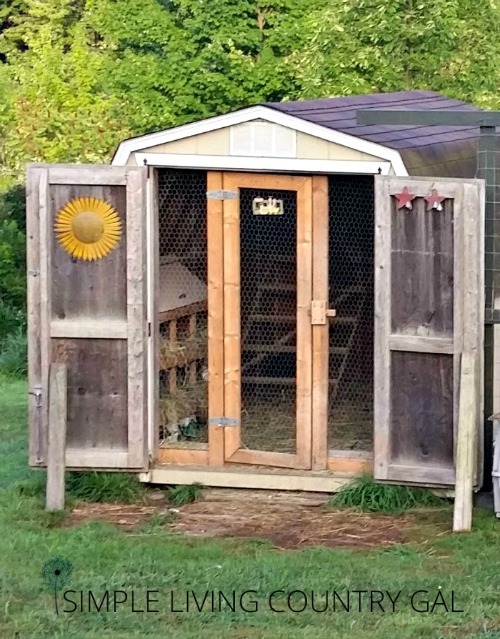 Since your hens will spend quite a bit of time inside of the coop you will want to make sure you have good ventilation and air flow. Stagnant air is bad any time of the year, so clean your vents and keep windows and doors free from debris. Ducks are a lot like chickens so much so that we house and raise ours altogether. The main difference is that ducks love the water and will gladly spend their days there. Becuase of this, they are usually cool even on the hottest days. If you don’t have a pond, no worries. A small pool will work just fine for a couple of ducks. 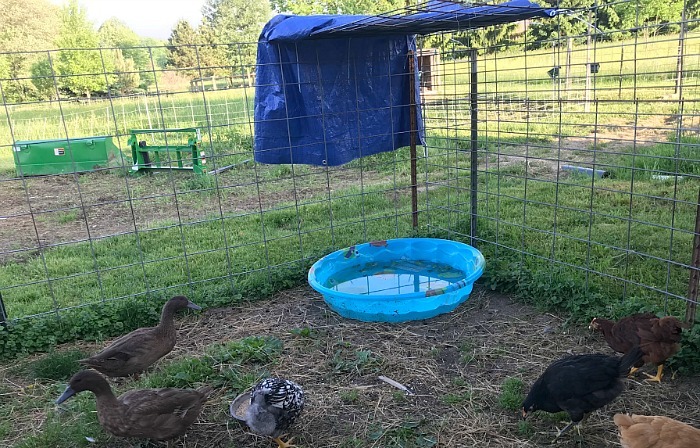 The main tip here is to change your water so it doesn’t get too filthy (ducks are far from neat) and to make sure you have it under some sort of shade so the water does heat up. Luckily goats are all able to sweat and pant so they always tend to cope with the heat better. With that being said, I still like to take precautions. 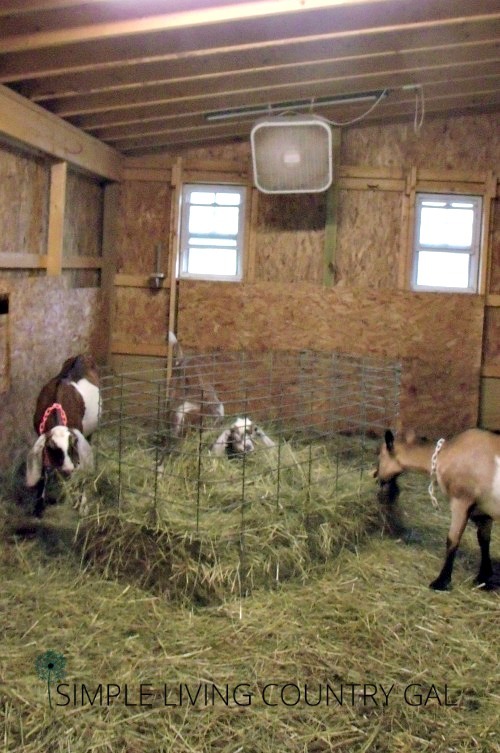 I have fans suspended from the ceilings over each of my main pens in the barn. This also helps with air flow which is incredibly important in a stuffy barn. 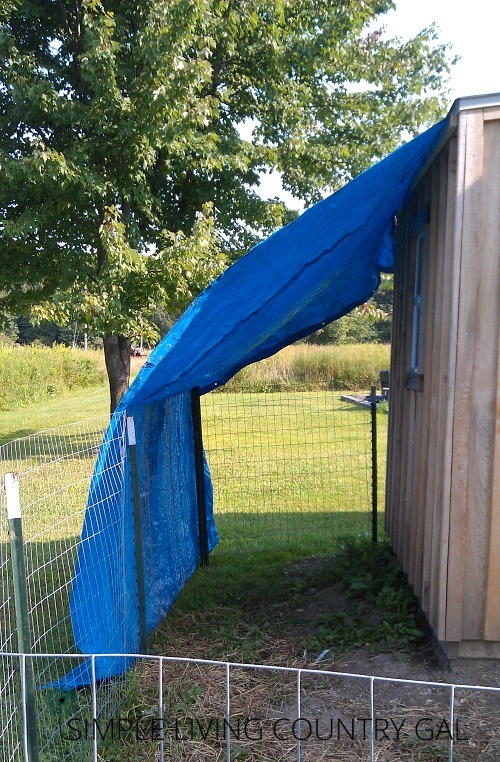 My bucks who are housed outdoors have a shelter that will get them out of the sun. We also have a nice shade tree that we keep mowed down tight as a reprieve to get to while grazing. 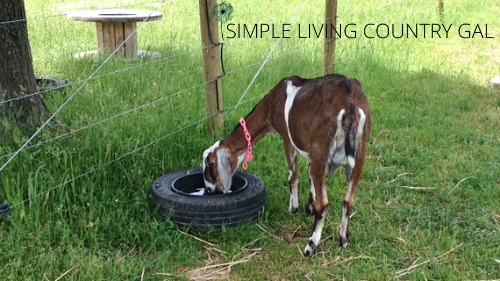 All of my goats get fresh water 3-5 times throughout the day. Above all things, it is incredibly important to remember….water, water, water. Keep it fresh and keep it cool. The last thing we want is a warm glass of water on a hot day to keep their water cool to encourage them to drink. Have plenty of options as well. Want to do just a little bit more? Ad some ice cubes! 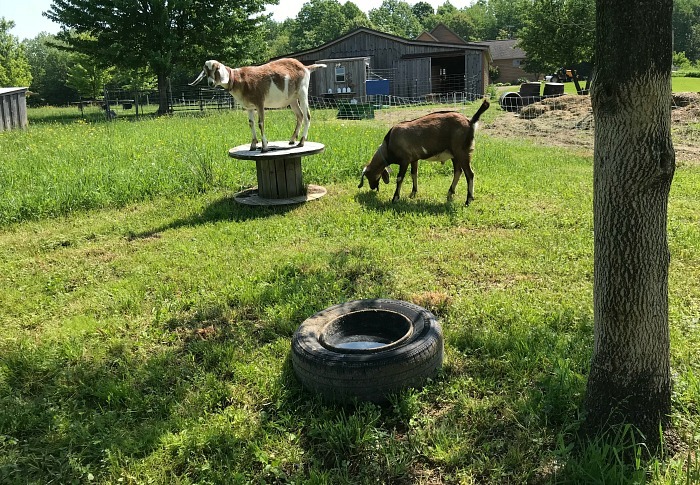 Goats love to play and it’s comical to see them dunking for cubes while they are drinking. Finally, with my dairy gals, I like to shave them at the beginning of summer. Yep, shave them all the way down. I do this while they are eating in the milk stand and use my pet clippers (people ones are durable enough) leaving the attachment off. I do one side at a time so it does take a few days to get everyone done but this will really do a lot to keep them cool. No one wants a winter coat during the summer and having all that hair off is something they love. No more fence itching! How to keep animals cool in the summer – final tips. Tip #1 Offer fresh water throughout the day. Change out warm water several times on a very hot day. Yes I know, it takes extra time to change the water out but this one small step can keep your animals cool and healthy. Tip #2 Keep things clean. At least weekly wash out your water bowls, jugs, or buckets. You will be amazed at how finicky some animals can be and simply by washing things out a bit you will encourage them to drink more. You know it’s funny, but my goats will rush me when I come out with clean fresh buckets and drink and drink and drink. Tip #3 Watch your animals for signs of distress. No one is around your animals as much as you are, if any of them are acting off even in the slightest way do not delay to investigate. Heat stress can kill an animal quickly, so be aware of any changes in your animals no matter how subtle. A few things to watch out for. Tip #4 Provide a shaded area. Make sure your outdoor animals have a shaded area out of the direct sun. You can use a tarp, sheet of plywood or anything that will provide some sort of relief. If you have a tree that they can get under that will usually be enough. As an added step keep a bowl of water under that tree as well. Tip #5 Get those fans moving! Sometimes it is necessary to call in back up. 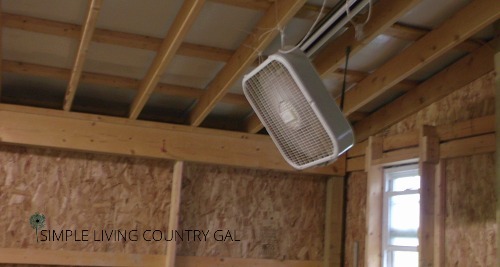 If you have electric you may want to hang a few inexpensive box fans to get the air flow moving. We have about 7 of these babies that I use in our barn and in our home. They work perfectly last us about 3-5 years or even longer for the ones we use in our home. Each spring we hose them down and let them dry in the sun. That is pretty much all the maintenance you need to help them last. You would be amazed how it helps even when the air is hot and thick. Remember your animals depend on you for their comfort and safety. Taking a few precautions and learning to read your animals for any changes will go a long way to keeping them healthy and happy. What tricks have you learned to help keep your animals cool in hot weather? Please share below, I would love to hear from you! « 10 Minute Decluttering Tasks You Can Do Today!